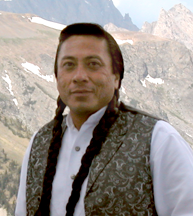 James Trosper is an Alumni of the University of Wyoming; currently employed as the Director of the High Plains American Indian Research Institute. James Trosper served as Director of Indian Child Welfare and Director of Family Services for the Northern Arapaho Tribe. James Trosper was appointed by President Nichols to be the first director of the Native American Education, Research and Cultural Center. He was also the first chairman of the Advisory Committee to President Nichols on Native American Affairs at the University of Wyoming. Trosper is on the Awards Committee of the Chief Washakie Memorial Endowment at the University of Wyoming and is the Chair and Executive Director of the Chief Washakie Foundation. He was appointed by the Governor of Wyoming to the University of Wyoming Board of Trustees and served from 2002 to 2013. He has also served on the Chief Washakie Sculpture Committee, the Fremont County Historic Preservation Commission, the Wyoming Indian Affairs Council, and on Boards of Directors for the Wind River Youth Council and Grand Teton National Park Foundation. An enrolled member of the Minnesota Chippewa Tribe, White Earth Reservation, Judith Antell was founding director of the University of Wyoming’s American Indian Studies Program from 1993-2014. She retired from the University of Wyoming in May 2014, but returned in the fall of that year to direct the High Plains American Indian Research Institute. She’s excited to be involved with this exciting initiative and to be able to work with talented colleagues and with tribal communities in the region. Dr. Antell received a B.S. degree in sociology from Minnesota State University, Mankato; a M.A. degree in sociology from the University of California, Santa Barbara; a Ph.D. in Ethnic Studies from the University of California, Berkeley. Daniel Antell, Shoshone/Paiute, graduated from the University of Wyoming with a bachelor of arts in American Indian Studies in 2013. In 2010, Daniel spent time abroad studying at the University of Waikato in Hamilton, New Zealand. In addition to sharing his time with HPAIRI, he holds a position with the University of Wyoming Information Technology sector. Daniel is honored to be involved with HPAIRI and he looks forward to new experiences and new opportunities to serve others.